Or how to turn your beach holidays into an adventure! Do not let summer pass you by without taking advantage of the long days and brilliant sunshine. There is no better way to spend a summer than exploring the beauty of Europe. If you are planning to spend your holidays by the beach, consider uplifting your time with great ecotourism experiences at sea. You will be mesmerized by what you discover and wonder why you didn´t try these activities sooner! Do you know what coasteering is? It’s okay – not a lot of people know (yet! ), as it is a relatively new, but increasingly popular way of exploring the coastline. Coasteering combines rock climbing, scaling, swimming, and jumping from heights, as participants move along scenic coastlines. Don’t worry – you aren’t doing this unprotected! Participants wear wetsuits, helmets, proper footwear and life jackets to keep safe and are always accompanied by experienced guides. Coasteering can be adapted to all activity levels, from very beginners to seasoned athletes. Whether you want to try an easy coasteering adventure in the Causeway of Northern Ireland, or dive in and try an intermediate-level escapade in Arrabida, we can guarantee you’ll get to experience coastal ecosystems in a new, invigorating way. Even if you aren’t much of a swimmer, you can still explore the beauty and incredible eco diversity that lives under the sea. Snorkeling is a fantastic, easy-going sport that allows you to discover the beauty of the ocean while still breathing in the air from above. All you need is a mask, a snorkel tube, and fins, which are usually provided by most organized tours...so basically you will need is your lungs, hands, feet and open eyes to enjoy the beauty of the marine realm! There are plenty of opportunities for snorkeling in Europe and many great, knowledgable operators offering fantastic guided snorkeling tours all along its diverse coastline. Here's a selection of the very best! These beautiful,massive marine mammals are simply fascinating to watch. Whether they are traveling with their pod or taking care of their babies, you are sure to be entertained. Take advantage of the fact that Europe has an amazing, rich marine wildlife all the way from the Atlantic to the Mediterranean and treat yourself (and the whole family!) to an enjoyable day of whale watching. If you want an activity a bit more engaging and physically active than whale watching, sea kayaking is a great way to enjoy the outdoors while exploring Europe from a new angle. Paddling on the water can be very tranquil and peaceful – specially when the sun is setting and you pair it with a wine tour! But it can also be physically challenging, if you choose to go wild...! As the options are plenty, here's a sample of the best sea kayaking holidays and tours out there. Whether you’ve tried snorkeling before and are ready to take it to the next level, or want to be daring and dive right in, scuba diving is an adventure you will not regret and never forget. There’s a completely different world under the sea, and scuba diving lets you explore all the beauty and magic of it, up close and personal. If you’re new to scuba diving, consider a a try dive or a full diving course in the stunning waters of Catalonia, Spain. 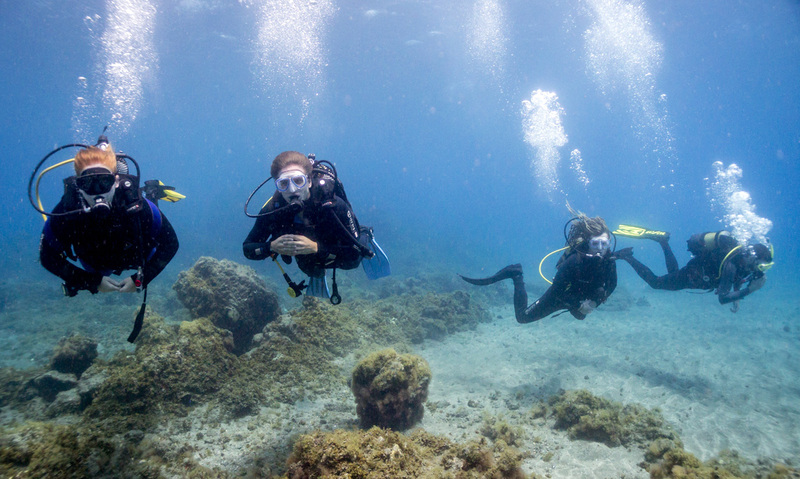 For more advanced divers, take your exploration to the next level in the waters of Liguria (Italy), Donegal (Ireland) or the Scottish Highlands! Photo by Amarilla Divers, a proud member of Wildsea Europe. We hope you’ve learned about some new activities and are inspired to try something new this summer. We’d love to hear about your adventures! If you want to share your story on our blog, drop us a line and we will set you up for our hall of fame!